Idea and realization: Dmitry Vilensky (Chto Delat /What is to be done? )Special thanks to all artists, authors, translators, and friends who made this publication possible. 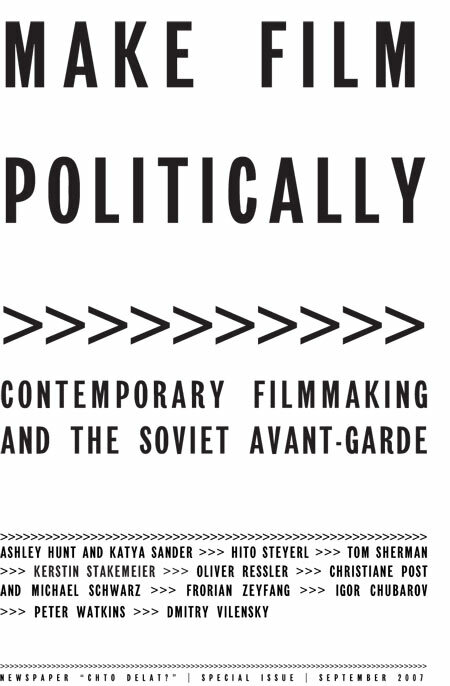 Dmitry Vilensky /// What Does It Mean to Make Films Politically? All those who understand that aesthetics, politics, and economics form a vital nexus believe that art can reveal with particular force the most acute problems of social development. History is a clash between different groups who defend not only their right to speak out, but also their vision of the future. If we wish to continue the political project today we must first pose the old question: Who is the subject of historical development and knowledge? And we must actualize the simplicity of the old answer: the struggling, oppressed class itself (Benjamin). Contemporary political art strives to be consonant with the search for this subject, not with the mythic subject of previous social revolutions. As in the mid-19th century, we are once again hard pressed to say what this subject will be like. Nowadays we should, rather, speak of a fidelity to the old answer. This doesn’t mean that filmmakers, intellectuals, and artists should personally keep faith with the current anti-capitalist movement. They should remain faithful, rather, to the space of subjectivity that gave rise to the movement. If we can somehow develop the idea that individuals and community groups – i.e., the public – can and should play a greater role in deciding and creating what they (we) see on the mass audiovisual media (MAVM), then we will have taken a major step forward. Central to this proposal is the concept that the ideas and initiatives of the public, if absorbed into the creation of the mass audiovisual media, would help break down many of the existing hierarchical forms and practices. It’s all a matter of confronting the visual elements one way or another. It’s all a matter of intervals. The journal of the Left Front of the Arts, LEF, was where the fathers of Soviet and world cinema, Sergei Eisenstein and Dziga Vertov, first announced their theoretical projects. It was still difficult, however, to sense in these brief manifestos (“Montage of Attractions” and “Kinoks”) the principal differences in how the two men saw the nature and tasks of (Soviet) cinema. These would become apparent later, in the late twenties, and would be impartially discussed in the pages of New LEF. Their approaches might be crudely summarized as affective-manipulative (Eisenstein) and machinic-democratic (Vertov). These stances made absolute two discrete aspects of the aesthetic doctrine of productionist art as developed within the LEFnamely, a notion of arts goal as the sensual manipulation of the emotions of the viewer, listener, and reader versus the view of art as life-construction involving the creative participation of everyone. If one approaches the ubiquitous Jean-Luc Godard from the “other side,” the other of Peter Wollen’s “Two Avant-gardes,” it seems that the experiment is what made it possible (for Godard and others) to make film politically in an ideal film world. What did this mean to experimental filmmakers? In how far is (and was) their work political? In The Two Avant-gardes, an essay that appeared in Studio International in November 1975, Peter Wollen describes the discussions between two avant-garde movements. The filmmakers  he mentions the auteurs in France and a few Germans  are on one side, while the co-ops – experimental filmmakers who come from art, most of them from New York and England  are on the other. For the purposes of this small contribution, the debate between these two side can be summed up as follows: the filmmakers accused the co-ops of being elitists; the co-ops refuted this with an attack on the traditional form, whose retention would make real change impossible. In one of his essays , Jacques Rancière asks: what type of fiction is the genre of documentary film? His answer is that a documentary is not the opposite of a feature film only because it presents images of everyday life or evidence from archives instead of falling back on actors interpreting a fabricated story. It is rather a different mode of cinematographic fiction, a different way of constructing a plot, breaking down a story into sequences or assembling shots to form a story, of prolonging or condensing time. According to Rancière, a documentary film is both more homogenous and more complex. More homogenous because the person who conceives the film is also the one who realizes it, documentary cinema is thus the epitome of the author film; and more complex because sequences of heterogeneous image material are usually connected. I began to make films because of I was interested in forms that allow the presentation of artwork beyond the boundaries of art, a field I sometimes find restrictive. The majority of my films could be understood as attempts to afford more visibility to activist practices and social movements by describing actions, organizational forms, possibilities of agency, and underlying theories from the perspectives of the protagonists involved. Since my films do not take a “neutral” stance, they are often accused of being “partisan,” and this is something people often hold against me. However, I doubt that this “neutral” stance is even possible, since the very definition of “neutrality” derives from social power relations. What Are the Current Characteristics of Vernacular Video? ― Displayed recordings will continue to be shorter and shorter in duration, as television time, compressed by the demands of advertising, has socially engineered shorter and shorter attention spans. Video-phone transmissions, initially limited by bandwidth, will radically shorten video clips. I vividly remember a strange broadcast a few years ago. On one of the first days of the US invasion of Iraq in 2003, a senior CNN correspondent was riding in an armored vehicle. Jubilantly, he stuck a direct broadcast cell phone camera out of the window. He exclaimed that never before had this type of live broadcast been seen. And that was indeed true. Because one could hardly see anything on these pictures. Due to the low resolution, the only things in sight were green and brown blotches, slowly moving across the screen. Actually, the picture looked like the camouflage of combat fatigues; one could only guess at what these abstract compositions were supposed to depict. Are these documentary images? If we use a conventional definition of the documentary, the answer to this question is obviously no. They bear no similarity to reality; we have no basis for judging whether reality is being shown here in any objective way. But one thing is clear: they seem real enough. No doubt many people in the audience think they are documentary images. Their aura of authenticity is a direct result of their unintelligibility. If you catch these thieves, you might ask them how vision is affected by the mass-distribution of images  images captured by cameras, framed by lenses, operated by camera operators and directed by directors and paid for by producers, translated into emulsion, magnetic waves or digital bits, edited by editors and distributed massively by entities with an enormous reach into the spaces we inhabit and travel through? >>> Youre not talking about seeing a camera, youre talking about just seeing, right? Do you mean how they see the world differently because of the images that exist in it as well as of it? In-and-of the world? >>> And the structure of those images. What they picture and what they conceal; what they postulate and what they shut down; where they place you and who they ask you to be. Similarly, how do these technological images in turn structure how we see the world? Is our vision technologized? >>> Okay, Ill do that. Should I record their answers? 1. Intro: I will try to answer on a core questions of the Conference: how is Medvedkin’s cinema related tot he Marxist theory and practice? Following Badiou and Godard we can argue that considering the history of 20th century cannot be done without two signifiers: cinema and communism, which both speak about certain emancipatory promise, passion of the Real. This class coalition becomes very clear in times of Russian revolution, strengthened under the slogan of Lenin that names film as the most important art of revolution. For Medvedkin’s particular contribution in this “transformative” period, I would like to add another signifier to the 20th century chain – TRAIN, or what can be named communist cinema-train. A rare interview with one of cinema’s most secretive filmmakers. Originally published in Libération, March 5, 2003.